This bash script is does not add database details or change site name, unlike our previous script to install WordPress. Your Working Server Will Be Ready to Run the Installer From Browser Web Interface. This Bash Script to wget WordPress Will Perform Some Automation Possibly Most sysadmins will will want. It automates the boring part and for bash shell itself gets auto deleted. Most advanced users do not want automation of all the steps for WordPress Installation. Man to man choice varies widely. #!/bin/bash # WGET script for Latest WordPress by Dr. Abhishek Ghosh # License : GNU GPL 3.0 # for test run, put in any empty dir and run echo "WGET WordPress Script" wget http://wordpress.org/latest.tar.gz echo "WordPress tar ball downloaded" tar -xzvf latest.tar.gz echo "WordPress tar ball uncompressed" rm latest.tar.gz cd wordpress mv * .. cd .. rm -r wordpress echo "WordPress files moved where this script is" mv wp-config-sample.php wp-config.php echo "wp-config.php is copied" rm readme.html rm license.txt clear echo "+++++++++++++++++++++++++++++++++++++++++++++++++++++++++++++++++++++" echo "| Complete! |" echo "| |" echo "| Open browser window and start installation of WordPress |" echo "| or edit wp-config.php in case of moving WordPress. |" echo "| |" echo "| For WordPress and Server tutorials visit : |" echo "| |" echo "| https://thecustomizewindows.com |" echo "+++++++++++++++++++++++++++++++++++++++++++++++++++++++++++++++++++++" rm -- "$0"
echo "WordPress tar ball downloaded"
echo "WordPress tar ball uncompressed"
echo "WordPress files moved where this script is"
echo "| Open browser window and start installation of WordPress |"
echo "| or edit wp-config.php in case of moving WordPress. |"
echo "| For WordPress and Server tutorials visit : |"
These few lines are hugely painful to do for repeat works. We could use sed to add some data, but basically for Apache, Nginx there are other works. This set is crux of the most commonly done steps. This Article Has Been Shared 1581 Times! 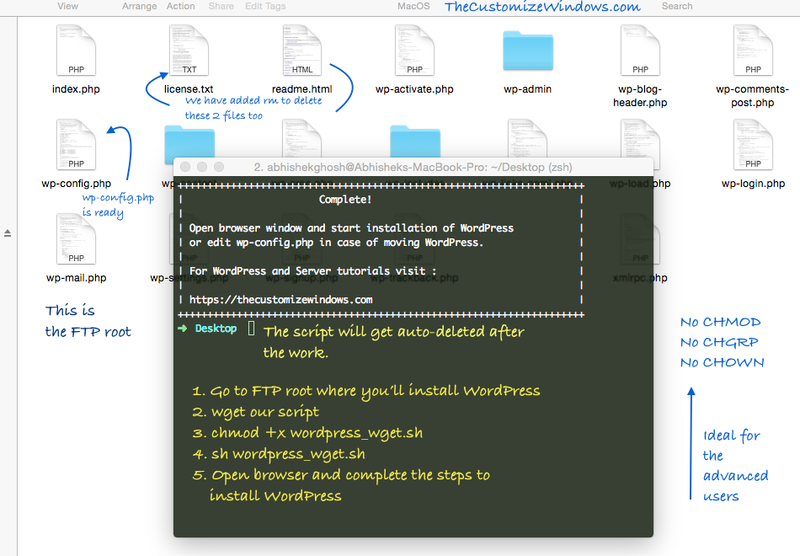 Cite this article as: Abhishek Ghosh, "Bash Script to wget WordPress : Ready to Run the Installer," in The Customize Windows, January 30, 2016, April 23, 2019, https://thecustomizewindows.com/2016/01/bash-script-to-wget-wordpress-ready-to-run-the-installer/.